The RT-33, features a metal head with threaded studs for screw-on non-marring, plastic tips. 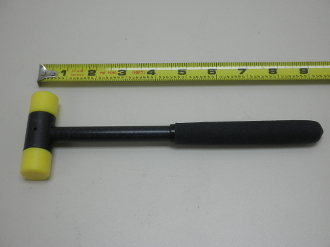 This hammer is fitted with an aluminum handle which is firmly cross-pinned, with a removable steel spring pin, eliminating all possibilities of the handles ever loosening due to atmospheric changes. Great for gunsmith, aerospace/aviation, automotive, jewelry and speciality home use applications.